Figure 1. The solubility of a substance is different in different solvents. When immiscible solvents are shaken together, any compounds present are divided between the two liquid phases. 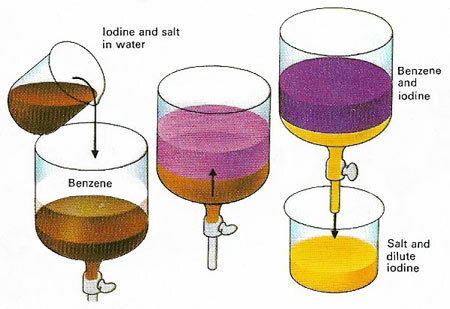 If a solution of iodine and salt in water is shaken with benzene, iodine dissolves in the benzene layer, but salt does not. Thus it is possible to separate the two. Many different compounds can be purified in this way. Figure 2. These curves show the variation with temperature of the solubilities of crystalline substances. 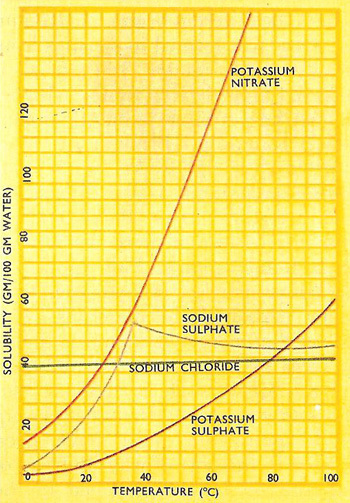 Whereas the solubility of sodium chloride increases only slightly as the solution is heated, much more potassium nitrate will dissolve in hot water than in cold. Solubility is the extent to which a solute will dissolve in a solvent. It is usually expressed in grams per 100 grams of solvent at a specified temperature. Sugar dissolves more easily in a freshly poured cup of tea than in a cup of tea which has been left standing for a while and has cooled. With many other solid substances, too, larger quantities will dissolve in a solvent when it is hot than when it is cold. Furthermore, at any one temperature, there is a great variation in the quantity of different substances which will dissolve in the same amount of solvent. Sodium chloride is said to be very soluble in water because very many of its crystals have to be added to the water before no more will dissolve. When some of the crystals remain on the base of the container and will not dissolve even after a lapse of time, the solution is said to be saturated. In contrast, a saturated solution of a substance like calcium hydroxide (slaked lime) is obtained after only a few lumps are added to the water. Calcium hydroxide is, therefore, only slightly soluble in water. Although it may sufficient, in many instances, to know that potassium carbonate is very soluble while calcium hydroxide is only slightly soluble, there are occasions where where it is necessary to be more precise about the solubility of a substance. Chemists have, therefore, defined solubility as the number of grams of the substance (i.e., the solute) which at a specified temperature will dissolve in 100 grams of the solvent to form a saturated solution. There is, however, an alternative and quicker method of making a solution which will be saturated at a particular temperature. The solvent is heated until its temperature is well above the required level. Small portions of the powdered solid are stirred in until no more will dissolve (i.e., until some of the powder remains on the bottom of the beaker some time after it was added). Then the solution is set aside to cool. If it is required that the solution is saturated at a temperature other than room temperature, it must be placed in a thermostatically controlled bath, which is maintained at the required temperature. This method is, of course, only applicable to substances whose solubilities increase as the temperature of the solution is raised. Thus, as the solution cools it becomes more saturated. Once the solution is saturated any further cooling should result in small crystals of the solute (i.e., the dissolved substance) being deposited. As cooling continues, the crystals grow because more of the solute is rejected from the solution. So the solution is saturated at any temperature below that at which crystals first started to form. But before a sample is withdrawn time must be allowed for the solution to reach equilibrium. This applies particularly if the solution is being cooled, for all the solution must be at the same temperature and an opportunity must be provided for further crystals to be deposited. Once the saturated solution has been made, all that remains is to find out how much of the solid is dissolved in a known weight of the solvent. A convenient way of doing this is to draw off into a pipette between 20 milliliters and 30 milliliters of the solution. Great car must be taken in using the pipette in case a few fine crystals are also withdrawn at the same time. (Alternatively the solution may be decanted to separate it from the deposit of crystals). The contents of the pipette are then run into a previously weighed evaporating dish. The dish is weighed again after the solution has been added and then the solution is heated carefully so as to drive off the solvent. The final stages of the evaporation must be carried out cautiously, as many solids tend to spit when they are almost dry. The last traces of solvent are best removed by drying in an oven. After the evaporating dish, which now contains only dry crystals of the solute, has cooled and been weighed, the dish may be heated again in the oven to see if all the solvent has been driven off. To be quite sure that the correct weight is recorded, the processes of heating, cooling, and weighing should be repeated until two successive readings are the same. From the sequence of weighings, the weight of solid and the weight of pure solvent (not the weight of solution) can be found. It is then fairly easy to calculate the solubility of the substance at that temperature. The easiest way of depicting the variation in the solubility of a substance with temperature is to plot the information as a graph (see Figure 2). Such graphs are known as solubility curves. To obtain the curve for one substance it may be necessary to determine its solubility at perhaps 5° intervals over the whole temperature range for which the solvent is a liquid. Once the curve has been plotted, the solubility at any temperature within the range may be read off. Under normal circumstances, the maximum amount of solid that will dissolve in a solvent at a certain temperature is the amount necessary to yield a saturated solution. It is sometimes possible, however, to have a solution which contains rather more solute than is required to saturate it. Such a solution, which is unstable, is said to be supersaturated. Supersaturation usually occurs when a hot solution which contains neither crystals of the solute nor dust is set aside to cool. The excess of solid may remain in solution so long as the solution is left undisturbed, and no dust is allowed to enter the container. However, once a tiny crystal of the solid is dropped into the solution, crystallization starts at once and continues until only sufficient solid to saturate the solvent remains in solution. Solutions of some solids (e.g. sodium thiosulfate or "hypo") are particularly liable to become supersaturated, and it is for this reason that a few crystals should always be present in a vessel containing a saturated solution. This article has been concerned only with solutions of solid substances, although both liquids and gases dissolve as well. But whereas the solubilities of solids usually increase as the temperature of the solutions increase, the solubilities of gases fall off as the solvent is heated. Carbon dioxide and to a lesser extent oxygen dissolve in water, but both gases can be driven off from the water by heating. Some of the first bubbles which rise in water as it is being heated toward its boiling point contain the gases which had previously been dissolved in the water.